BOSTON - This season’s BC High starting lineup is filled with varsity inexperience, but so far the Eagles have yet to skip a beat. 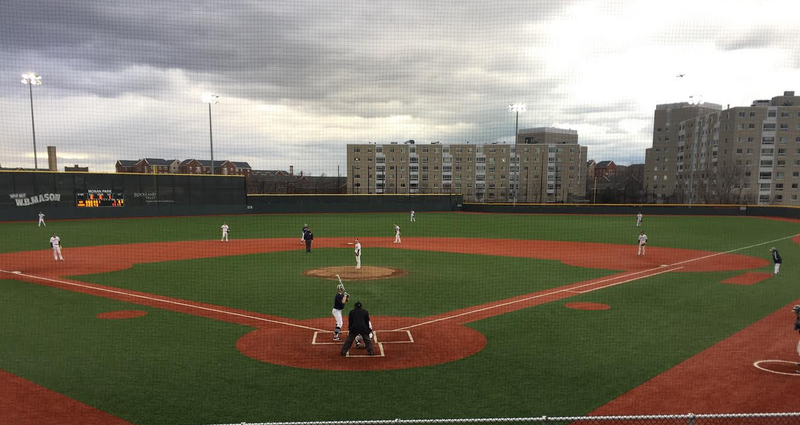 On Friday afternoon, behind six innings of one run ball from Brendan Mignone, and three hits from Matt Sullivan, BC High came away with an 11-1 rout of Lexington on a chilly day at Monan Park in Dorchester. BC High (2-0) has combined to shutout their opponents 17-0 over the first two games of the season. Mignone, a University of Rhode Island commit who was making his first career start, showcased terrific command of his fastball locating for most of the afternoon on the corner and at the knees. When it was time to fool the opposing hitter Mignone (6 IP, 1 ER, 6 H, 2 BB, 4 K) turned to his slider. The breaking ball could be seen starting at the batter’s hip only to cut back over the inside corner. Eagles’ coach Norm Walsh said Mignone, while a three-year varsity player, was at his best on Friday. BC High gave Mignone a bit of a cushion right out of the gate, scoring two runs in the first to jump out in front. Kyle Burke walked, advanced to second on a passed ball, and Sullivan drove him in with a line single to right. After Sullivan walked and stole third, the Shrewsbury native scored off a balk to put the Eagles up to 2-0. One inning later the Eagles doubled their advantage, this time due to some Minutemen mistakes. Sean O’Connell and Kyle Brennan drew back-to-back free passes and moved up a base on a sacrifice bunt. Burke followed up by hitting a sinking line drive towards second base that hit the grass and bounced over the right arm of Lexington second baseman Trevor McGovern. The error allowed both O’Connell and Brennan to come on home to give BC High a 4-0 lead after two innings. Lexington had an opportunity to claw their way back into the contest in the top of the fourth. To begin the inning Zach Stevens walked, and moments later Nico Frelick slashed a double down the left field line to give the Minutemen runners on second and third with nobody out. Mignone, however, was at his best in his toughest spot of the game. The right-hander proceeded to strike out McGovern with a devastating slider, and induce a shallow fly ball to right and ground out to second to retire the side without any damage. BC High effectively put the game out of reach in the bottom of the fourth. O’Connell launched a double that one hopped the wall in right field, advanced to third on a fly out, and came around to score on an error. After Sullivan singled to right to give the Eagles two base runners, Marty McCormack came through with an RBI single to give BC High a 5-0 advantage. Finally, Gavin Reilly capped off the four run frame with a two-run single to centerfield that put BC High firmly in command, up 8-0 heading into the fifth. Sullivan, who has five hits through two games this season, all to the opposite field, said he is simply translating what the Eagles work on in practice into the game. The Minutemen’s lone run of the game came in the top of the sixth as Frelick was hit by a pitch, then came around to score on a McGovern RBI double.